Haven’t decided on a hotel yet? You can look at other available hotels in the Highland region with Booking.com. Every image of Scotland you’ve ever dreamed of is found in its northern Highland region. Majestic mountain landscapes, romantic glens, brilliant purple and green moorlands, and dramatic and moody skies fit for a Sir Walter Scott novel exude an epic quality found nowhere else in Britain. Lonely castles loom from the mist that dances upon dark lochs—the only reminders of centuries of strife among the infamous Scottish clans. Castle lovers will find no shortage of magnificent towers to explore. In this region, too, you’ll find one of the most highly rated castle hotels in Europe, the castle-home of the Stuart family complete with a haunted tower, and a former archbishop’s palace. With a mystique that draws travelers back year after year, come and step into a timeless world. Loch Ness You can’t say you’ve visited the highlands of Scotland without stopping by its most famous loch. Nessie, its resident monster, seldom surfaces, but you can read all about the various investigations into the myth—one that’s been going since the 6th century—at the Loch Ness Exhibition at Drumnadrochit. On the loch’s shores, spend a day picnicking at the ruins of Urquhart Castle—an ideal spot for monster sightings. Cawdor Castle All though there’s no truth to it, Cawdor has often been considered to be the 11th-century home of Shakespeare’s Macbeth with its famous murder scene of King Duncan. Historically, Cawdor has been continually occupied for 600 years and is the home of the thanes of Cawdor. It’s quite a romantic spot with its turreted tower, moat, drawbridge, and extensive grounds. Eilean Donan Castle Located on the Kyle of Lochalsh, Eilean Donan Castle is the darling of Scotland’s travel posters. Hugely romantic in appearance, it was built in 1214 as a defense against the Vikings and blown up by the Royal Navy in 1719 in response to a Spanish Jacobite landing. Restored in the 20th century, the castle has starred in a number of movies. Culloden Moor On 16 April, 1746, the Jacobite forces of Bonnie Prince Charlie perished under the superior forces of the Duke of Cumberland, the son of King George II, marking the final battle fought on British soil. The National Trust of Scotland has re-created the battleground. The Cairngorms National Park Established in 2003, the Cairngorms National Park is Britain’s largest. The extensive mountainscape includes 52 peaks at over 900 meters, a quarter of Britain’s woodland, and a quarter of its threatened wildlife species. Hikers, enthusiasts of winter sports and water sports will find plenty of activities in this extraordinary area. Glencoe Towering peaks and pristine glens will inspire outdoor enthusiasts in one of the Highlands most dramatic landscapes. Here, too, is the site of the infamous massacre of the MacDonald clan by their guests, the Campbells. The area is now under the National Trust. Ben Nevis Serious hikers appreciate the challenge of reaching the top of Britain’s highest peak (1342 meters or 4406 ft). If the unpredictable Scottish weather cooperates (blizzards can occur even in summer months), the spectacular view from the top extends for 100 miles. Non-hikers can take a cable car half way up. Glen Nevis, a glacial valley with a path that winds through a dramatic gorge, rewards hikers with waterfalls and wild flowers. Isle of Skye Spectacular mountain vistas, a rugged volcanic plateau, and sea lochs that slice into the island, creating miles of dramatic coastline, make for some of the most dramatic scenery in Britain. In addition to such outdoor pursuits as hiking, biking, and rock climbing, visits to Dunvegan Castle—the seat of the Clan MacLeod since the 11th century—and the Talisker Distillery, which produces a fine single malt whisky, are worthwhile. 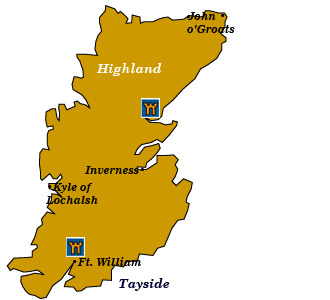 Malt Whisky Trail Although the famed Malt Whisky Trail is over to the east in the Grampian region, worthwhile day trips from the Highland region can be made. Grampian also boasts a Castle Trail, Coastal Trail, and Victorian Heritage Trail.